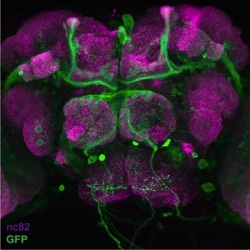 neurons in the brain of Drosophila melanogaster. Jim Robinson, a graduate student in the Joiner lab. 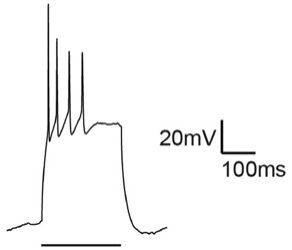 Spike frequency adaptation of a hippocampal pyramidal neuron. Synaptic plasticity in these neurons is modulated by Ly6h, a protein whose properties were first described by Clare Puddifoot and Meilin Wu, two postdocs in the Joiner lab. 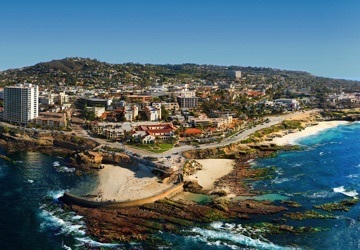 Aerial view of La Jolla, home to UCSD. Model for hypothetical neural circuit underlying sleep homeostasis. (A) Cholinergic (ACh), octopaminergic (OA) and dopaminergic (DA) systems promote waking. But a subset of cholinergic neurons also promotes the slow accrual of homeostatic pressure. (B) When this pressure exceeds a certain threshold the homeostat discharges to inhibit waking and drive the need to recover lost sleep. Snake α-neurotoxins evolved from homologous three-fingered molecules found in all animals called Ly6 proteins. Unlike snake toxins, which are secreted, most Ly6 proteins are tethered to the outer leaflet of the cell surface, where they modulate the functions of membrane signaling complexes. Our understanding of how snake toxins poison neurons and muscles thus helps us understand how structurally related Ly6 proteins contribute to normal functions of animal cells. For example, α-bungarotoxin interferes with binding of the neurotransmitter acetylcholine to nicotinic acetylcholine receptors (nAChRs), an effect that is mirrored to a lesser degree by some Ly6 proteins, such as Ly6h and Lynx2. Our lab has shown that these Ly6 proteins mildly reduce the potency of agonists such as acetylcholine and nicotine for nAChRs. Our lab has also shown that some Ly6 proteins regulate the efficacy, or maximal response, of nAChRs to agonists. For example, Ly6h and Lynx2 suppress cellular responses to acetylcholine and nicotine by trafficking nAChRs away from the cell surface. 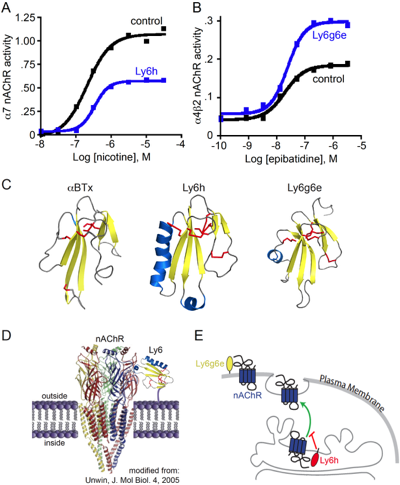 In contrast, other Ly6 proteins such as Ly6g6e appear to interact with nAChRs at the cell surface to acutely potentiate receptor signaling in the presence of agonists. Roles have been proposed for nAChRs or their modulators in Alzheimer’s disease, nicotine addiction, and sleep regulation, including sleep-dependent consolidation of cortical plasticity. We are studying how Ly6 proteins may contribute to these conditions. We are also studying whether mimetics or antagonists of Ly6-nAChR interactions may provide selective pharmacological means of combating disease states. Ongoing projects include determining: (i) the mechanisms by which Ly6 proteins regulate nAChRs and other membrane receptors; (ii) the structural basis for interactions between Ly6 proteins and receptors; (iii) the contributions of Ly6 proteins to hippocampal plasticity; and (iv) the roles of Ly6 proteins in disorders of the nervous system. Sleep transforms the brain from a dynamic information processing system into an organ that is unresponsive to all but extreme sensory stimuli. This state renders animals unconscious for hours each day, thus limiting self-defense and searches for food. Surprisingly, however, the needs fulfilled by sleep remain unknown despite decades of study. The existence of these needs is underscored by several findings. First, sleep is highly conserved across evolution. Second, sleep is homeostatically controlled. That is, loss of sleep at one time is normally compensated by an increase in depth or duration of sleep at a later time. Third, if sleep compensation is prevented then organisms suffer negative consequences. For example, lapses in attention and memory impairment are common following sleep deprivation, and in extreme cases death can even occur. Unlike constitutive changes in arousal, which are mediated by mechanisms that have been described by our lab and others, sleep need is poorly understood. In fact neither its neuroanatomical loci nor its molecular basis have been identified. To address this major deficiency, my lab has developed a simple, robust, high-throughput thermogenetic assay to measure the mysterious homeostatic process that senses and responds to sleep need. Using this asay we have demonstrated that surprisingly only a small subset of arousal-promoting neurons drives sleep need. Because these rare neurons appear to be sensory in nature, their responsiveness to different cues presents us with the unusual opportunity to identify information that is most relevant to sleep need. Through unique anatomical, genetic, and proteomic screens we have also identified additional circuit components and molecules that contribute to this phenomenon. These and additional studies are providing unique information about the unknown needs that sleep fulfills. Ongoing projects include determining: (i) the cellular functions of newly identified sleep-regulating genes; (ii) how these genes control neural circuit function; (iii) the roles of identified genes and neural circuits in synaptic and behavioral plasticity; (iv) new techniques for mapping functional neural circuits.